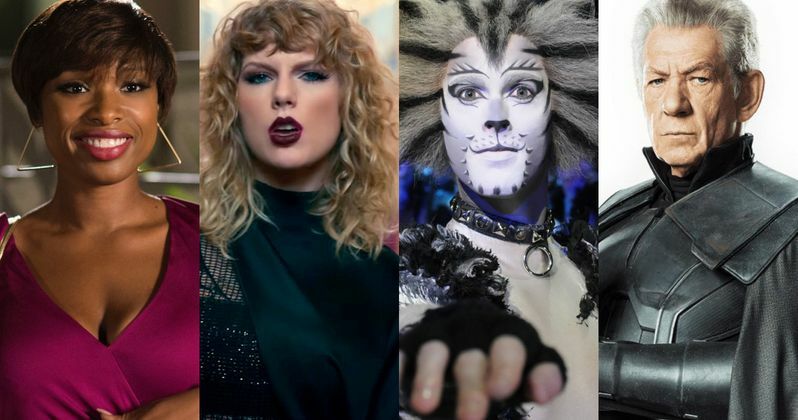 The musical Cats is being turned into a movie and the project is heating up, as four new cast members have joined the adaptation. Taylor Swift, Ian McKellen, Jennifer Hudson and James Corden have all signed on to star in the movie musical, which has been in the works for several years now but appears to be moving toward production now with the addition of these cast members. This is a diverse group of talent, but one that proves Universal is trying to make this thing a hit. Taylor Swift, though known best as a musician, is no stranger to acting. She appeared in The Giver, Valentine's Day and voiced a character in The Lorax. Something like Cats certainly will play to her strengths as a performer. As for Ian McKellen, he may be known best for his work as Magneto in the X-Men franchise and as Gandalf in Lord of the Rings, but he's spent a whole lot of his career as a very respected stage actor, so this also lines right up with what he's best at. Jennifer Hudson definitely has the musical chops for this and James Corden also has a lot of musical experience from his days before becoming host of The Late Late Show. He still makes time for a movie now and again though. His last musical was 2014's Into the Woods. Cats the musical is based on T.S. Eliot's whimsical collection of poems, Old Possum's Book of Practical Cats. Andrew Lloyd Webber's popular musical brings together a tribe of Jellicle Cats on a moonlit evening, who must make the "Jellicle choice" to decide which of them will ascend to the mysterious Heaviside Layer to be reborn. It's the fourth-longest-running show in Broadway history and, until 2006, was the longest running. It held that title for nearly a decade, starting in 1997. The musical was awarded seven Tony Awards in 1983 and won the Laurence Olivier Award in both 1982 and 2015. Andrew Lloyd Webber's Cats initially opened in 1981 on the West End before making its way to Broadway the following year. Tom Hooper is on board to helm the movie adaptation. He previously directed the Best Picture Oscar-winner The King's Speech. But he's also got a background with musicals, having also 2012's Oscar-nominated Les Miserables, which was a big hit at the box office as well. Working Title and Universals have teamed up for the Cats movie, which doesn't yet have a release date. The screenplay comes from Lee Hall (Billy Elliot) and Andrew Lloyd Webber will be involved with the big screen adaptation. Production is expected to begin later this year in the U.K., but no specific filming dates have yet been revealed. More cast members are due to be announced in the near future before filming gets underway. We'll be sure to keep you up to date as more information on the project is made available. This news comes to us courtesy of The Hollywood Reporter.